Occupy Central protesters, camping on the plaza beneath HSBC's Central headquarters, remained at the plaza on Monday night even after its deadline to evacuate the site ordered by the court. More than 100 people, including some parents brought along their children, attended an anti-evacuation concert to support the occupiers. Policemen and firemen were dispatched to handle any possible conflicts. HSBC indicated that they would not force the protesters to leave on Monday night while the latter made it clear that they would not leave voluntarily. The High Court ordered the activists to vacate the open space by August 27 at 9 pm, a decision that appeared to spell the end to one of the world's longest-surviving anti-capitalism camp outs. A couple of stalwarts remained at the venue, claiming they had no plan to budge, threatening to continue their 10-month-long encampment. Onlookers came by Monday afternoon to check out the group's posters and photographs. There was no visible police presence. HSBC stationed some of its guards nearby. Occupy Central protesters pitched their tents at the site last October. The demonstration is an offshoot to the Occupy Wall Street movement in New York, which inspired similar protests around the world. The protesters, however, appeared to be losing team as some of the demonstrators who have occupied the site for months, packed up and left. The plaza is the bank's property, but was deeded during construction in 1983 as an area dedicated to serve as a public pedestrian passage. HSBC applied to the courts in June for the removal of the protesters, claiming the occupiers have taken over the open-air passageway without its consent. A HSBC spokesman said earlier, if the protesters did not clear out, the bank would ask the court to assign a bailiff to carry out the eviction order. The protesters maintained that they were not spoiling for a fight with police and the demonstration would move elsewhere. They refused to disclose any details of the planned move. A female protester, surnamed Tam, told China Daily that the occupiers didn't want to leave. "Some of our members left. I don't know what will happen tonight, like what the police are going to do with us. If they don't resort to violence, then we'll stay here. As for me, I think it's better to leave for a couple of days and find out the situation." "But some members will stay here," Tam said. "It's much better to avoid violence right from the beginning. If we don't take violence, I think the police will not do it to us, either." When asked about whether the protest would continue if the scene were cleared, she said new plans were under discussion. "Tonight the final result will appear. It won't end in stalemate," Tam believed. She also expressed appreciation for the public support, which she said gave the demonstrators the confidence to hold out. Another long-time activist Sumer Ho Yiu said he would carry on the protest in another place. "(I) respect the court's ruling and the government's stance," Ho said. 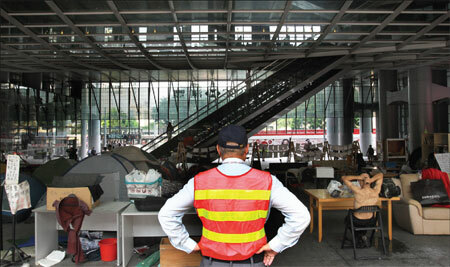 "I will use a wheelbarrow to move (my belongings) to the protest area at the Legislative Council. I will pitch (camp) there if they allow me or else I will sit at the site for a whole night." A concert in the plaza - which featured bands such as Relaxpose, Dada Baba, Laura Palmer, and Heyo - was held at 7pm. Chun Feng contributed to this story.